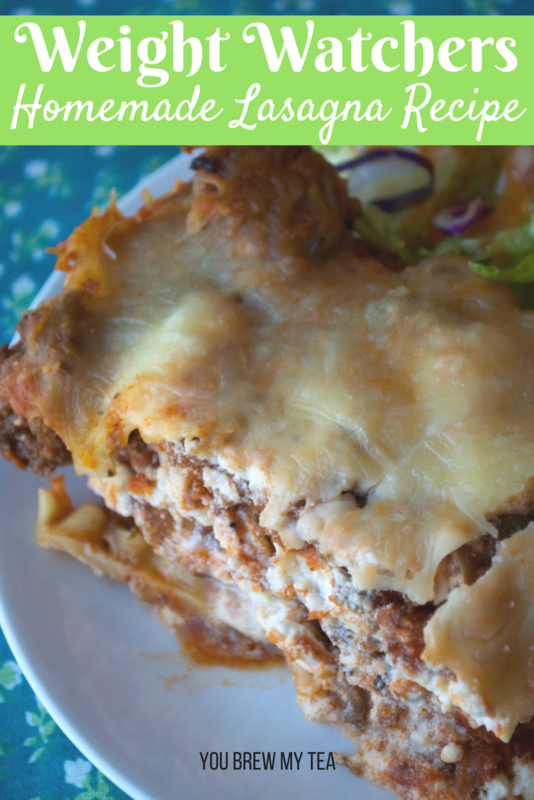 This Homemade Lasagna Dish is a perfect way to add a delicious family-friendly recipe to your meal plan. This has always been a comfort food for my family, and when my friend Emilee made this for us a few weeks ago, I knew it had to be shared with you! 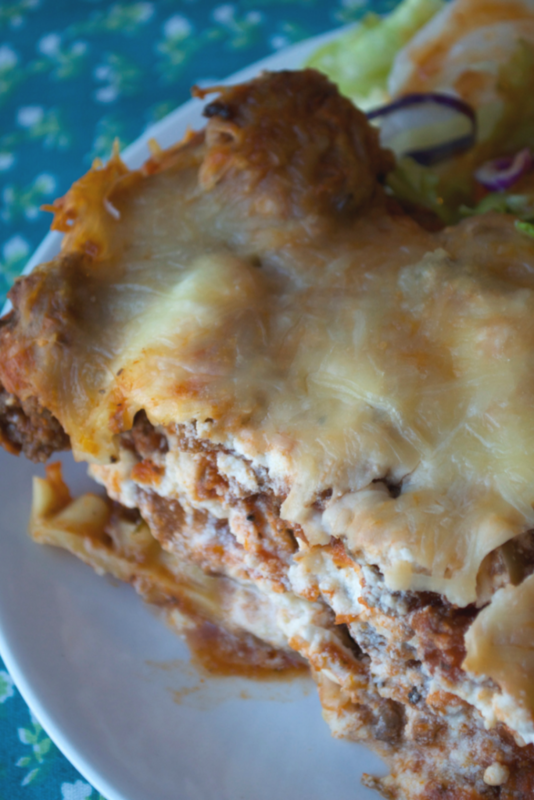 Making this lightened up homemade lasagna dish for your family doesn’t mean you have to use all of your Weight Watchers points in one meal. 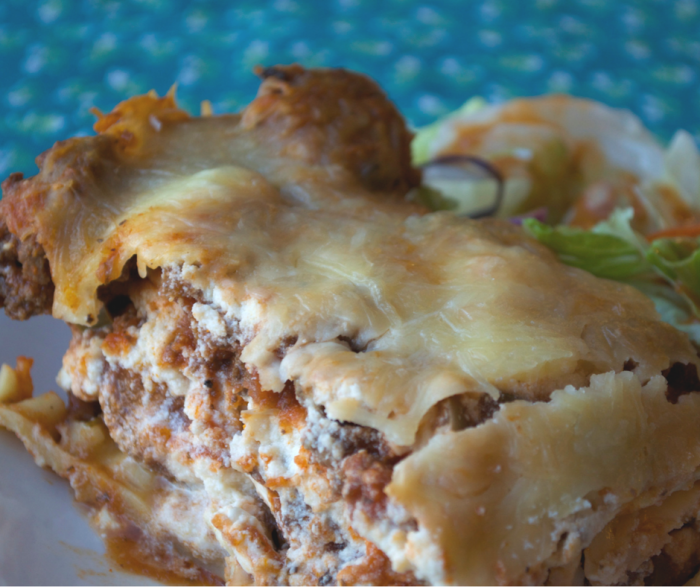 We’ve lightened this up by using 99% fat-free ground turkey, low-fat cheeses, and a homemade sauce that will provide tons of flavor. You will love how filling this is, and be happy kids will enjoy it as well as the adults. In a large stock pan, saute ground turkey and ground sausage for 7-8 minutes, or until cooked through. Add in bell peppers, onion, garlic, tomato sauce, tomato paste, dried basil, dried oregano, salt, onion powder, and black pepper. Stir to combine well, and reduce heat to medium. Cover and let cook for additional 15-20 minutes stirring occasionally. Prepare a 9″x13″ casserole dish by spraying with non-stick spray. Turn off and remove sauce from heat and stir well. Place 4 lasagna noodles on the bottom of the casserole dish and top with 1/3 of the sauce mixture. Top the sauce mixture with 1/3 the cheese mixture. Top the last layer of lasagna with the remaining one cup of mozzarella cheese. Prepare a 9"x13" casserole dish by spraying with non-stick spray. Place 4 lasagna noodles on the bottom of the casserole dish and top with ⅓ of the sauce mixture. Top the sauce mixture with ⅓ the cheese mixture. 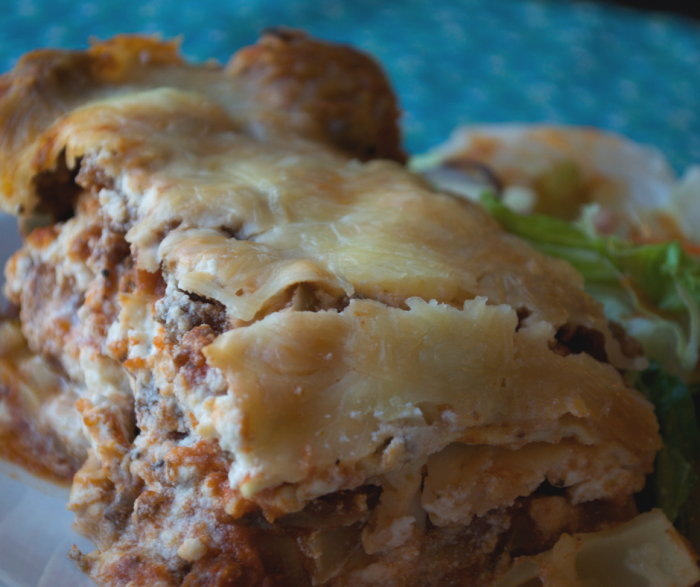 This homemade lasagna dish is a perfect treat for the weekend. It does take time to make sure the sauce is cooked well, and the dish layered properly, but the time spent is well worth the effort. It makes 10 generous portions and is a great main course with a zero point salad when you are on Weight Watchers. Thanks, for sharing you have some great recipes.